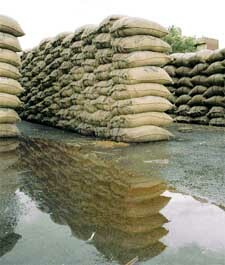 Heavy rain and hailstorm lashed the district this evening and damaged standing and harvested paddy crop. The condition was bad at the Kutchi markets in the district where water collected due to the downpour. Ludhiana today became the first city in the country to have a dung-based power generation plant. The Minister of State for Science and Technology, Mr Rakesh Pandey, today inaugurated the high rate biomethanation power project for recovery of energy from the dairy waste. The Civil Surgeon, Ludhiana, has ordered a probe into the incidence of the alleged negligence of a surgeon at the Civil Hospital, while operating on a teenage girl of a poor backward class family of nearby Assi Kalan village. 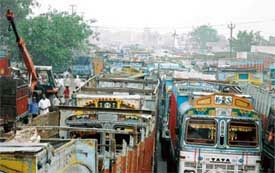 Restrictions on the import of scrap, resulting in it’s scarcity, created panic in industry today. Scarcity led to a sharp rise in steel (round) prices as well. “Steel rates have already increased by Rs 1,500 per tonne for a round,” said Mr K.K. Garg, President, North India Induction Furnace Association, adding, “instead of stopping import and harming the industry, the government should come out with some other alternative.” With this, industrialists will not be able to meet their export requirements, he said. A team of experts from the Punjab Armed Police Battalion, Jalandhar, finally arrived at dry port here today to examine six containers of scrap which are suspected to contain live bombs. Four persons received injuries when a fire broke out in Veenu Knitwears, a hosiery in New Shivaji Nagar in the afternoon here today. As the fire engulfed three storeys of the factory, at least four workers received injuries when they jumped from the upper storeys seeing the fire. Two of them sustained fractures also and were admitted to a local hospital. 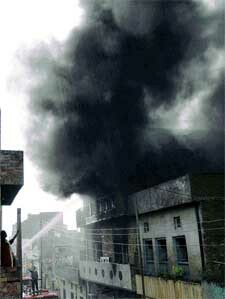 The fire broke out at 3 p.m. and spread very fast as the factory stored yarn for manufacturing monkey caps. It took the fire department three hours to control it. Surprisingly heavy downpour did not help them douse it. At least 10 fire engines were used to finally control it. Activists of the Youth Congress today burnt an effigy of Gujarat Chief Minister Narender Modi for his alleged derogatory remarks against Prime Minister, Dr Manmohan Singh in context of his religion. Residents of the Shaheed Bhagat Singh Nagar have demanded the setting up of an Old Age home in the area. According to a press release a meeting of the Shaheed Bhagat Singh Nagar Action committee was held here today under the chairmanship of ex-councillor, Pran Nath Bhatia. The Deputy Speaker, Mr Charanjit Singh Atwal, has observed that the role of the judiciary and legislature was complementary to each other. Mr Atwal was addressing the issues of the relationship between Parliament and the judiciary at a conference of presiding officers of the Legislative Bodies in India being held in Kolkata today, a press note issued by his local office said here today. I congratulate the reporter who wrote the piece. “Why not ban all yatras?” I entirely agree with him that rath yatras, prabhat pheris, shobha yatras and nagar kirtans are a constant source of inconvenience to the public of Ludhiana. The Jagraon police today claimed to have busted a gang of thieves who stole bags containing sugar from trucks. Six persons were arrested by the city police yesterday for failing to inform their respective police stations about their tenants and servants and booked under Section 188 of the IPC in violation of a recent order of the District magistrate which required all citizens to furnish such information to the police in view of the rising crime graph of the city. Mr Gurbax Singh and Des Raj both employees of the Municipal Council, Raikot have been booked under Section 409, 420, 34 of the IPC by police on the complaint of Executive Officer MC Raikot for embezzlement of Rs 2,63,839 and Rs 65,200 respectively, as they were posted as octroi clerks collected the amount but did not deposit the same in the account of the Municipal Council. The accused are yet to be arrested. A one-day workshop “Prerna: Achievement, Motivation and Contents” was held at SDP College for Women, here today. Mrs S. Verma, Principal of the college inaugurated the workshop. Nine participants made their presentations on various topics like positive approach in life, rights and duties, yoga, aim of human life, importance of mathematics and other subjects. Dr R.P.S. 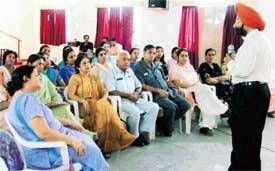 Luther delivers a lecture to the faculty of the SDP College for Women in Ludhiana on Monday. Mrs Renu Anand, a CBSE resource person, delivers a lecture at BCM Arya Model Senior Secondary School in Ludhiana on Monday. — Photos by I.V. Corporates are becoming increasingly aware of the need to create an employee-friendly environment in their organisations. The latest step in the direction is providing health care facilities to employees. The Electrohomeopathic Doctors’ Association, Punjab (EDAP) has a reason to smile. For their representation to Ms Sonia Gandhi, the chairperson of the National Advisory Committee (NAC) of the United Progressive Alliance government at the centre seems to have started yielding devidends.